when planning your next trip. 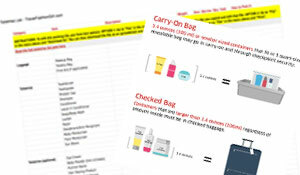 And don’t forget to download your free packing checklist! 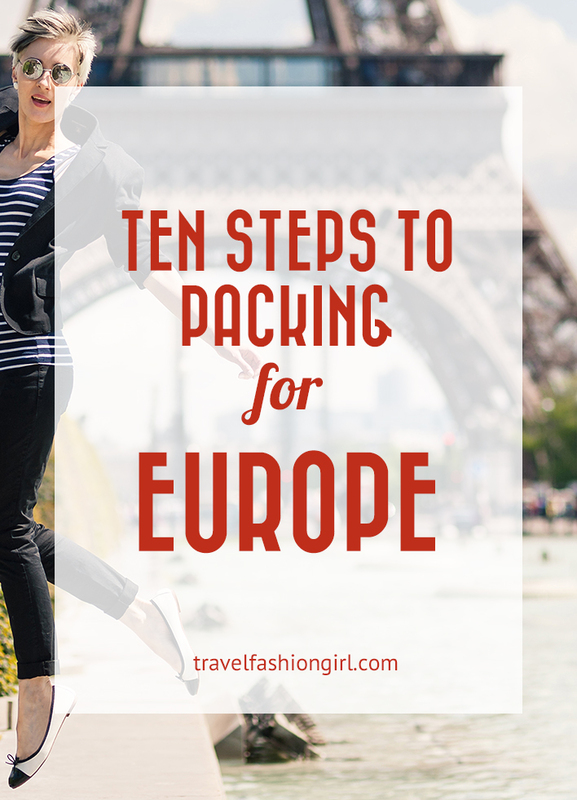 I’m Going to Europe and Have No Idea What to Pack! 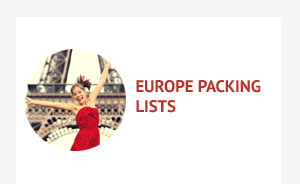 Start by reading the ultimate Packing List for Europe, which is a five part guide offering general packing information for Europe along with what to wear in spring, summer, autumn, and winter. This gives you thorough information on wardrobe suggestions by season as well as weather averages for several popular European destinations. 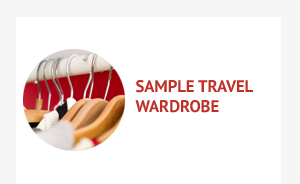 Based on a sample multi-country itinerary it will help you decide how to make your wardrobe relevant to all the stops on your trip. A capsule wardrobe is an essential concept to understand in order to create a minimal yet highly functional (and fashionable) travel wardrobe. 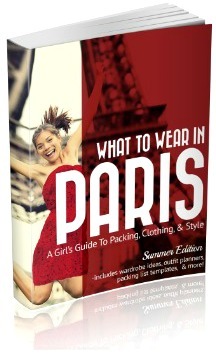 Read this packing ebook to help you create the perfect travel wardrobe for your trip. 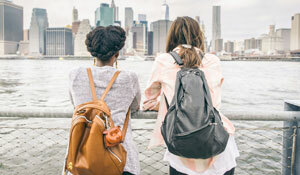 If you feel extremely overwhelmed at the idea of packing light or have a complicated itinerary, review this packing course which shows you specific techniques to plan around limited clothing choices, varying climates, and other unexpected life situations. This is how not to overpack for a 2-3 week trip to Europe. Check weather.com’s extended forecast in advance and 3 days before you leave. Think about how many days you will be in warm vs cold weather. If you have a 10 day trip to Europe and will be spending 7 days in the cold and 3 days in warm weather, plan for 70% of your travel wardrobe to be for the cold and 30% to be for the heat. If you are only spending a short amount of time in cold weather or if you’re unsure if you will encounter cold weather on your trip, pack only the essentials: two outerwear PLUS two additional items: long sleeve top and leggings. 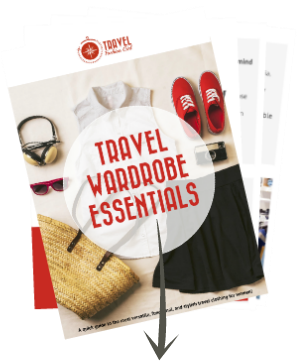 Use our Europe packing lists to find clothing ideas to dress appropriately for your destination then use the guidelines from TFG’s Signature Packing Lists to help you customize your travel wardrobe. If you don’t see your destination listed, post a question on TFG’s Facebook Group. Europe is a large continent and experiences a variety of weather. Depending on if you’re traveling in the north or the south you might encounter cold weather even in the summer. Always check the weather for your countries to get the most accurate idea about what to pack. Because many people visit multiple destinations, it’s very common to experience mixed weather on your trip any time of the year. Or if you’re traveling somewhere like the UK in summer, you might experience all four seasons on the same day! 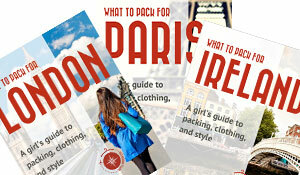 For tips on choosing clothing and shoes for trips with different types of weather, please read this packing guide. I’ve created this easy three part guide on how to pack for cold weather to help you stay warm while packing light. Knowing how to pack for cold weather travel can be quite daunting especially if you want to pack light. If you’re traveling in winter, bundle up! There is one major difference between being at home in the winter and traveling when it’s cold: the amount of time you’ll spend outdoors. When you’re traveling, you’ll likely spend extended periods of time outdoors sightseeing. Don’t be unprepared. 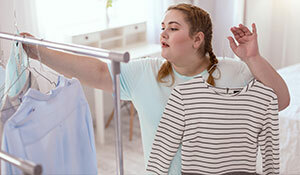 Consider layering lightweight clothing such as the ones featured in this Europe winter packing list to minimize the need for bulky sweaters and coats. Avoid bringing a thick heavy coat when possible and opt for a packable down jacket instead. Thermals are also key to keeping you warm without having to pack thick sweaters. Don’t skip these! 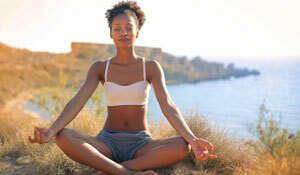 You can even wear leggings or tights under jeans or pants for extra warmth. If you’re not used to the climate, add additional layers until you feel warm. Don’t forget essential winter accessories like a scarf, hat, and gloves! Picking the best shoes for travel to Europe will be one of your biggest challenges so start by reading this 10 step guide to packing the best travel shoes for any trip. One unexpected issue that many travelers discover once they get to Europe are the cobblestone streets. While great to look at, stone streets aren’t always the easiest to walk on and can make for sore feet even if you don’t normally have discomfort. Depending on the city, these streets can also be hilly, slippery when wet, and uneven. 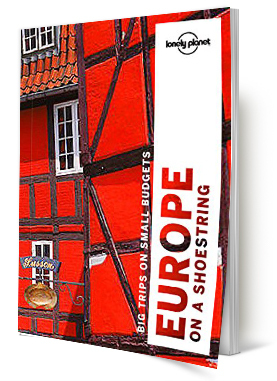 Find out how to choose the best shoes for Europe here. My biggest piece of advice is to choose function over fashion. Really? Yes! The last thing you want is to allow pulsing, injured, or tired feet prevent you from enjoying the trip of a lifetime. Bring no more than three pairs opting for shoes that match all your clothing. 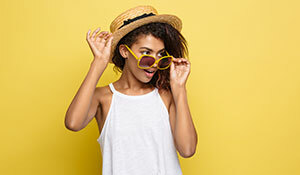 Pack one pair for sightseeing (walking), one pair of any special activities you have planned, and then a third pair to either dress up your outfits or one that’s appropriate for a change in weather. These are the best shoes for sightseeing in the cold and these are the best shoes for sightseeing in the heat. Black ankle boots like these are the most recommended shoes for Europe when dealing with either cold or mixed weather. Please note: ballet flats are a popular travel shoe option when you want a dressier look but they are NOT recommended for long hours on your feet sightseeing. Choose one of these cute and comfortable walking shoes instead – they’re the options most recommended by our readers! It’s important to note that Europeans generally wear the same things that everyone else does around the world – the only difference is HOW they wear them. People value simplicity, clean styling, and a good tailored fit above anything else. In general, day-to-day European style is more dressy than American style. This DOES NOT mean business clothing. Think dressy top (or the type of top you’d wear to work) plus nice jeans (dark colors are always a good choice). When it comes to jeans, a slim or skinny jean style is preferred to a bootcut. An ankle length pant is the perfect length; no longer, no shorter. If you’re not a pants person, black tights paired with skirts or dresses is perfectly acceptable. 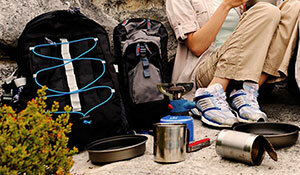 Like anywhere, pack for the environment. Are you spending your time café crawling in the cities or getting lost in the wilderness? As with most destinations, practical sense applies. Leave the beachwear on the beach because it doesn’t translate well to streetwear in the city. The same goes for gym wear; unless you’re actually headed to the gym, don’t dress in your gym attire. There are many misconceptions about what should and shouldn’t be worn in Europe. To clarify a couple of the most common myths: you DON’T need to wear slacks or business clothing to sightsee and locals DO wear athletic shoes especially these – they just tend to wear them with a fashionable outfit. One of the most important aspects about packing efficiently is using luggage organizers. Watch this packing video to learn how to use packing cubes to maximize space and never check a bag again. These are the top 12 reasons why I prefer packing cubes to other organizers. Start with luggage. If you don’t already own a suitcase, choose one wisely. Read these tips on how to pick a suitcase and consider one of these top brands. Make your life easy with our best suitcase recommendations. There are times when backpacks are better than wheeled bags. If you’re going on an adventurous trip, learn how to choose the best travel backpack. Use packing organizers. Do you want to know the ultimate tool to travel in a carryon? PACKING CUBES! They changed everything for me and thousands of other travelers. See my packing tutorial on how to use them! Trust me, they are a must! Use tried and tested packing strategies. For a summary, read our top 75 packing tips. Watch all my packing videos here! 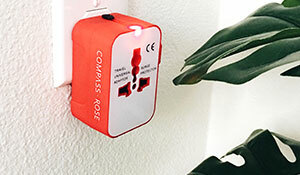 Find combination items. You can find two-in-one shampoos and conditioners, body cleanser that can double as shave gel, a foldable brush with a mirror attached on the handle, and multi-use makeup products. Purchase empty containers of various shapes and sizes and DO NOT default to choosing “travel size 100ml or 3oz” options. These are the best travel containers. Stick to the basics. Simplify your skincare and pampering routine and bring a capsule makeup collection. It’s only temporary. 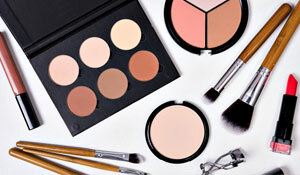 Replace liquid beauty products with solids. 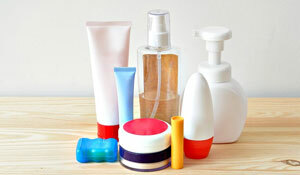 While solid toiletries may not help you downsize they will help you meet the carryon 3-1-1 liquids rule. 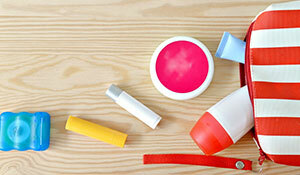 Choose the right toiletry bag. 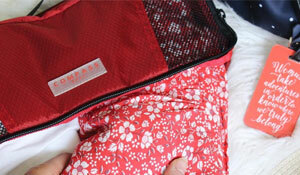 These are the best toiletry bags and these are the best hanging toiletry bags. For useful tips such as downsizing toiletries and choosing the best travel makeup, read our Ultimate Guide to Packing Toiletries. 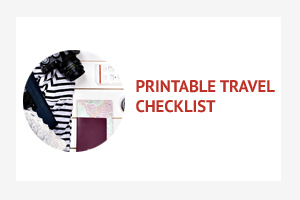 It includes a free printable checklist! Don’t forget about safety: Be cautious about where you stash your cash. The safest place for your passport is locked in your accommodation. Carry a photocopy or other ID when you’re sightseeing or are out at night. 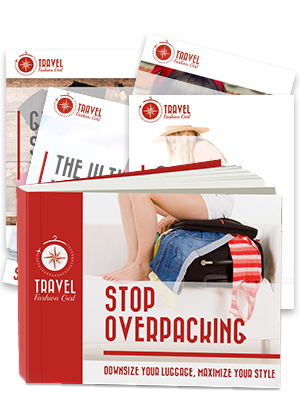 Sign up for Travel Fashion Girl’s monthly newsletter and get instant access to free packing templates, downloadable checklists, ebooks, and more! Remember, Europe is a large continent. While there are many similarities within the countries, you should still be aware of the things you need for your individual trips. Aside from reading Wikitravel and travel blogs, we still believe in a good old-fashioned travel guide for maps, suggested itineraries, local history, basic language phrases, and other practicalities. Your can download any of the below guides as ebooks or buy the print copies. Fortunately, country hopping in Europe is relatively easy with an abundance of transportation options to help you tick items off your bucket list. Research in advance to see which mode of transportation best suits your budget. Trains can be the most expensive way to travel when you compare them to cheap flights on airlines like Ryanair and EasyJet. For even more budget prices, check out long distance bus companies, too. If you are planning an inter-railing trip around Europe, check out this post for some train travel essentials to make your journey more comfortable. For accommodation, we love Airbnb for accommodation in Italy and other parts of Europe. Sign up here for a free $40 credit! I prefer to to book “the entire home” instead of opting for shared accommodation on Airbnb. Aside from safety, I also like to feel like I’m living in the destination. It’s a small taste of local life plus you get more amenities than you would at a hotel such as a kitchen and washing machine. If you prefer the convenience and comfort of a hotel room, I like using both Agoda.com and Hotels.com. Tip: Hotels.com gives you a free night for every ten nights you book! For flights, I like booking through Travelocity or Cheapoair (whichever one’s cheapest). Although I prefer Travelocity because they have a 24 hour money back guarantee. To maximize your vacation time, fly into the city where you’re starting your trip and out of the city where your trip ends. Many times it’s the same price and saves you from having to spend extra time and money to go back to where you started your trip. For hostels, we recommend Hostelworld and Hostelbookers. Always read the reviews before booking to get the best idea if the hostel is right for you. Some are quiet and family friendly while others are known for their party atmosphere. As a personal tip, if you’re backpacking, instead of booking all your nights in advance, maybe just book one or two so you can first get a feel for the place without overcommitting. Of course, should you be traveling during a special event or holiday, book in advance. Not sure about staying at a hostel? Read this. In the US it’s common to eat everyday meals with a fork. In Europe, however, it’s generally customary to use a knife and fork even if you’re eating in a casual restaurant. This small tip might help you blend in a little more than your clothing. For travel, I recommend Travel Guard, which saved me over $800 in hospital bills on my round-the-world trip. As a scuba diver, I also recommend using DAN, which helped me rearrange my and my husband’s flights at no extra cost when we had a dive incident. Tours are a great way to travel if you’re not ready to travel alone. 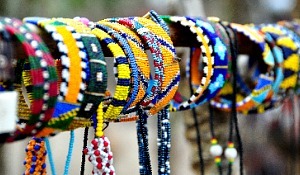 A few top choices include G Adventures or Intrepid Travel. While I haven’t traveled through Europe with G Adventures, I did go to South America and Africa with them as a new traveler in 2008 and enjoyed my experiences! One of my favorite type of tours to do when I travel are food tours. In Europe, I’ve received complimentary tours by Eating Italy, Eating London, and Madrid Food Tours. I can’t recommend them enough! In Rome, I did a City Tour and a VIP Vatican Tour with Roman Guy tours. Not only were there were only 3 people on my Vatican tour versus the groups of 25-50 around us but my guide Nina was a local fashionista. I also got to skip the massive lines and enter the Vatican one hour before the public! 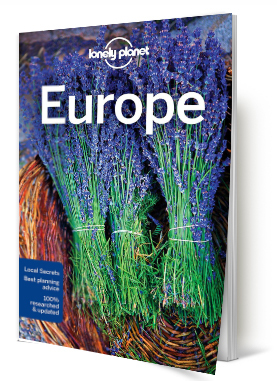 For more city tours, New Europe has excellent tours and the best part? They’re free! All you have to do is tip your guide. ARE YOU READY TO STOP OVERPACKING? LIKE THIS POST? PIN IT TO SAVE IT!